Very simple look today. I am kind of sad that I didn't have any decent silver polish to stamp with. That needs to be corrected soon. This is OPI I'm Not Really A Waitress with Konad black stamped using a Winstonia Plate. I need to have my co-worker Sue tell me what the symbol means because I have no idea. Tiffany and Emily, if you're reading this, go ask your mom so I will not forget. 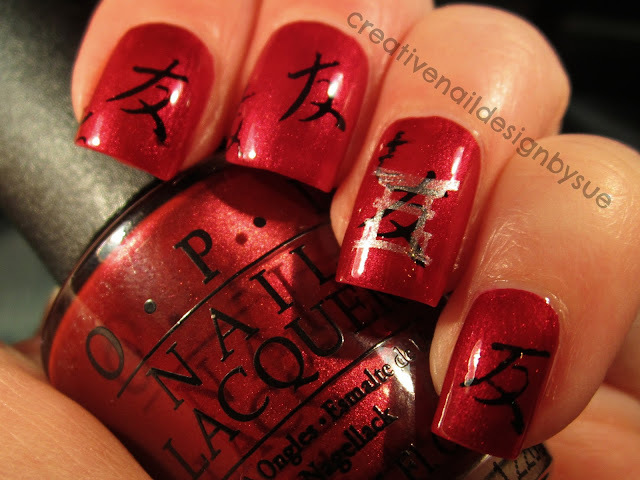 I tried stamping a Pagoda in the accent nail but it is really sheer. I still like the look and got quite a few compliments at the conference that I am attending this week. That wraps up stamping month for me. At least, for this particular challenge. Oh, and Pure Ice in Silver Mercedes makes a really fantastic silver stamping polish! Love this nail design, so pretty!